I’ve talked before about why I stopped writing on student papers, but today I want to talk about an important tool I used to be able to do that: rubrics. A rubric is a grid that expresses your expectations for an assignment using concrete, achievable descriptors. The biggest time-saving device you can have in your classroom is a good rubric. Make a clear and concrete rubric for everything you do in your classroom, and give it to your students up front. Let them know how the points are going to shake down, and they will have more ownership over the grade they receive. There are three main types of rubrics, so let’s quickly make sure we’re on the same page as to those types. This assigns a point value to each component of an assignment or process. For example, Content may be worth 30 points while Display is only worth 20. The points earned divided by points possible gives the student a grade out of 100. This will include multiple levels of proficiency and describe how a student could achieve each level. It is “holistic” because it doesn’t break down the paper into components like the Analytic (Points-Based) Rubric. It’s a whole view of the assignment, and you’ll have some way of translating the results into a grade (or not, depending on your school). This rubric only includes one level of descriptors (the “Proficient” level), with areas for improvement on one side and excellence on the other. The teacher then writes in specific feedback for improvement or excellence. 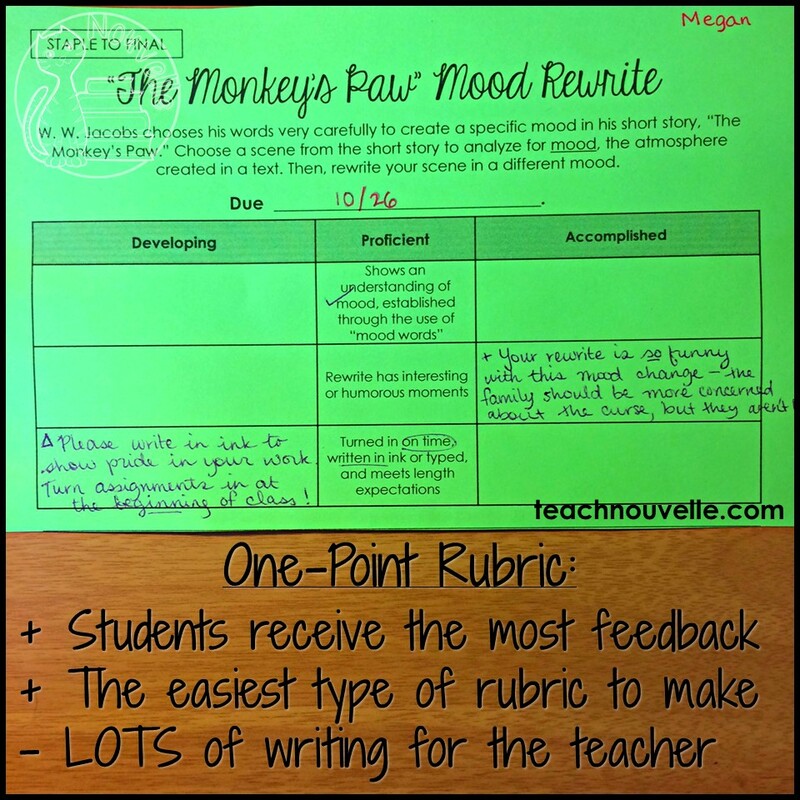 This type of rubric takes less time to create (woo-hoo! ), and the students are more likely to read the whole thing. 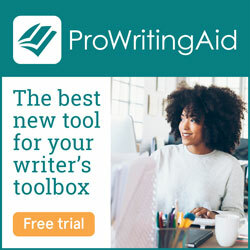 Still, it’s more writing time for you. Whether you create the rubric yourself or let your students create it, you’ll want a result that has streamlined language. This will help clarify expectations and assure that your students read it all. Honestly, I never make my rubrics bigger than half a page. And what about concrete objectives? Vague: Supports claims with evidence. Concrete: Each paragraph includes one or more pieces of textual evidence to support claims. Concrete: Includes a clear beginning, middle, and end and meets length requirements. 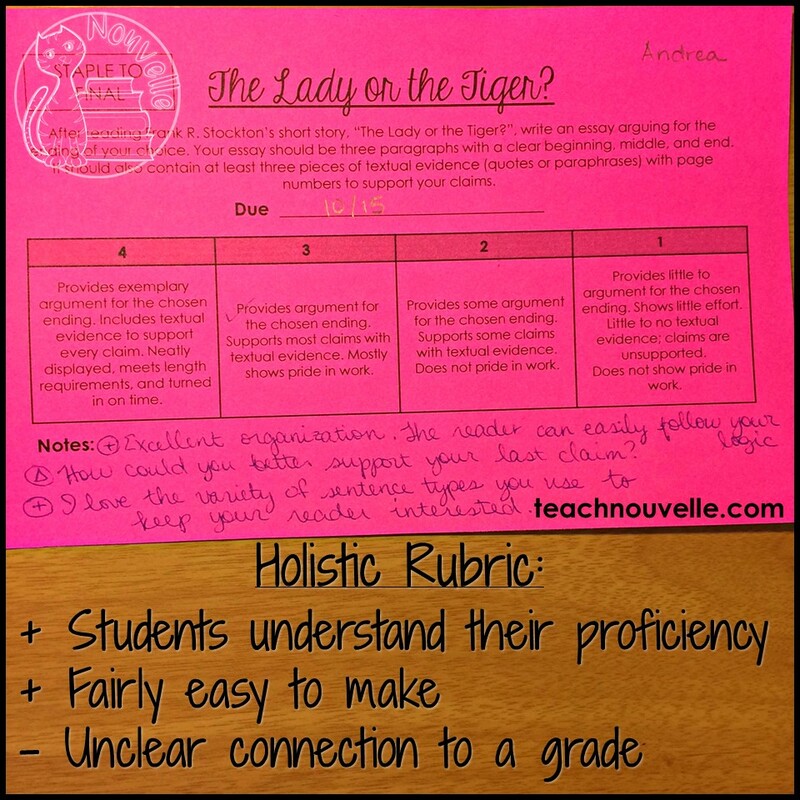 Clear rubric language can make grading easier. You can put a check mark next to a good descriptor and skip a lengthy comment. 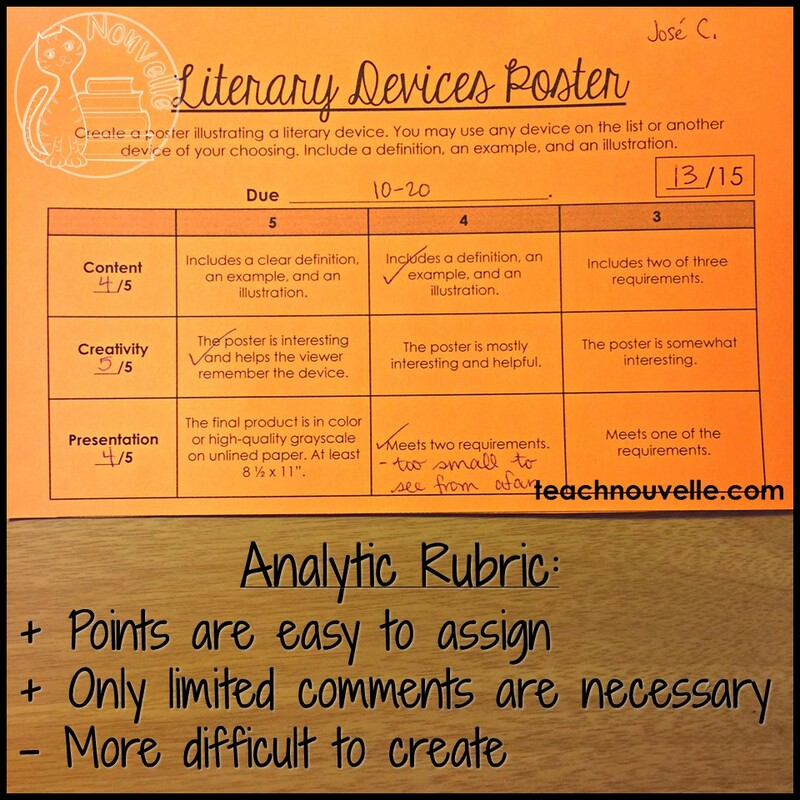 You can find a whole bundle of Editable Rubrics in my TeachersPayTeachers store. Hand out the rubric when you first discuss the assignment, and go over the proficient level with your students. Show models of what proficient projects and projects that exceeded expectations looked like in the past. Actually allow students to practice assessing a model with your rubric. Last year, I started requiring students to evaluate themselves (using the rubric) before they turned in their assignments. They had to choose the descriptors they best felt matched and give me an explanation why. You can also implement a Peer Review day a few days before the project is due and have students assess each other (only for feedback – not for a grade) using the rubric. Lastly, stick to the rubric. Grade evenly and efficiently, and don’t overthink what you already thought. If a student finds a way to “game” your rubric for some reason, applaud their critical thinking and don’t worry about it too much (and fix it for next time). What has been your biggest success with using rubrics? Let me know in comments. 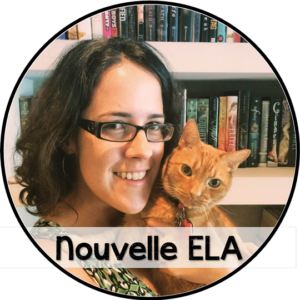 🙂 Be sure to subscribe to the TeachNouvelle Newsletter for monthly tips and resources for your secondary English classroom.